I cut my teeth on Australia v NZ Rugby League tests in the 1980s and 1990s which ironically were the reverse of today. In the 80s and 90s, New Zealand had a much better chance of knocking Australia off in a one off Test because if they ambushed Australia then the Kangaroos would have to wait a year for revenge. In a Test series NZ would often win or draw the first match only to get poleaxed in the rest of the series. Australia were always far too good. The recent Trans-Tasman Test was the first time it has felt different. For a number of years now New Zealand has been able to beat Australia in a longer tournament format. They broke a very long drought with their win in the 2005 Tri Nations series, a day I never thought I would live to see, which was backed up by wins in the 2008 World Cup, the 2010 Four Nations and finally the 2014 Four Nations. All of these wins were awesome, don’t get me wrong. I still always felt that Australia would balance the ledger in the Anzac Test. I thought NZ would be close but I thought Australia would probably still win in the end. I was hopeful but not confident. History has taught me that this would be when the Kangaroos would get their revenge. All complacency out the door. Everyone available for selection. For the first time in living memory, New Zealand backed up a successful tournament with a win in the very next match/series. The big difference was depth in every position. Back in the day if an important player like Stacey Jones, Ruben Wiki or Jarrod McCracken was unavailable then the Kiwis were in trouble. There just wasn’t enough depth to cover any losses. For this test, Dean Whare wasn’t available and neither was Jason Taumalolo. Dallin Watene-Zelezniak was ruled out and Jason Nightingale stepped in. In fact the Kiwis had the luxury of leaving out Jared Waerea-Hargreaves, Benji Marshall, Elijah Taylor and Lewis Brown. Brown was one of the better Kiwi players in the last Four Nations. Initial media response to the Kiwi win was largely that Australia was too old but prevailing opinion has swung back to the fact that New Zealand was too good this time rather than Australia being too poor. Jesse Bromwich and Ben Matulino bent the line on most carries and Martin Taupau led the bench with more of the same. Manu Vatuvei played one of his best games for the Kiwis setting the tone on most sets with a big hit up from kicks and was polished in his finishing as well. Shaun Johnson and Kieran Foran were sublime off the back of that with the NZ spine outpointing their Australian counterparts. In the end the defence of the Kiwis won the game. Australia threw everything at them but with a few exceptions were unsettled because of the defensive decisions the Kiwis were making. The Kiwis discipline also meant that for the most part Australia was starting sets from their own line. Probably the victory along with the success of the Fiji vs PNG and Tonga vs Samoa games and the international break in general has generated a lot of conversation around how to continue the improvement of International Rugby League. For instance, one of the proposals being touted is to allow players from second tier nations to play State of Origin. I generally agree with this proposal, particularly if it strengthens International Rugby League. Countries like Fiji, PNG, Samoa and Tonga will be stronger all the time instead of just at the World Cup. Also combinations can be developed. The effect that this rule will have on NZ should be monitored though because of dual eligibility for a lot of Polynesian players. Fiji/NSW or Tonga/QLD could be an attractive proposition. NZ could be weakened. And that would be a bad thing given it is taken the best part of 50 years for Australia to have anyone to consistently challenge them. I think the ledger would tilt closer to PNG if this rule came in as well. NBA playoffs. 7 game series remind me of Test matches in Cricket. Game to game adjustments. Fascinating. Daniel Tupou – Tries – 3, Run Metres – 121m, Try Assists – 0, Tackle Breaks – 4, Tackles – 9, Offloads – 0, Line Breaks – 2, Line Break Assists – 0, Errors – 0, Penalties Conceded – 0 and is he allergic to the touchline – Yes. Dene Halatau (Tigers) for Brenden Santi (Tigers) – Origin proofing + Santi hasn’t been playing for the Tigers. Reece Robinson (Eels) for Eto Nabuli (Dragons) – Ditto. Boaz Myhill (West Brom) for Ben Hamer (Leicester) – Strengthening my bench. Mignolet (Liverpool), Clyne (Southampton), Ivanovic (Chelsea), Terry (Chelsea), Sanchez (Arsenal), Eriksen (Spurs), Henderson (Liverpool), Hazard (Chelsea), Silva (Man City), Kane (Spurs) and Austin (QPR) with Myhill (West Brom), Vardy (Leicester), Bruce (Hull) and McShane (Hull) on the bench. 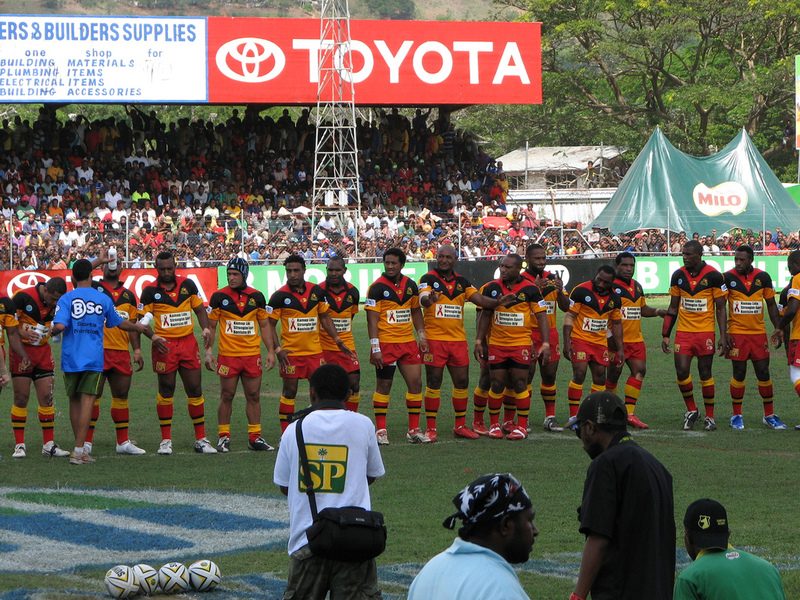 This entry was tagged Australia, England, EPL, Football, New Zealand, NRL, PNG, PNG Hunters, Rugby League, Soccer. Bookmark the permalink.